We’re already nearly one week in to Fairtrade Fortnight, which runs from 27th Feb to 12th March. This year the Fairtrade Foundation are urging us to take a break with fairtrade products. Fairtrade coffee, tea, chocolate and bananas are all readily available. We can enjoy our break in the certain knowledge that impoverished farmers and farm workers are getting a better deal than they otherwise might. At the risk of repeating myself, I’ve been a supporter of the Fairtrade movement for more years than I care to remember. You can even see a picture of me with painted face helping out in our local co-op in the Fairtrade Fortnight breakfast post I published last year. The Fairtrade Foundation have been doing a sterling job for many years, trying to eradicate the exploitation of small farmers and agricultural workers in developing nations. They and we still have a long way to go, but by ensuring we buy Fairtrade products where we can, we will be doing our bit to make farming equitable and sustainable. So take a break this #FairtradeFortnight. Grab a cup of fairly traded coffee, tea or cocoa and head over to the how to put Fairtrade in your break page. 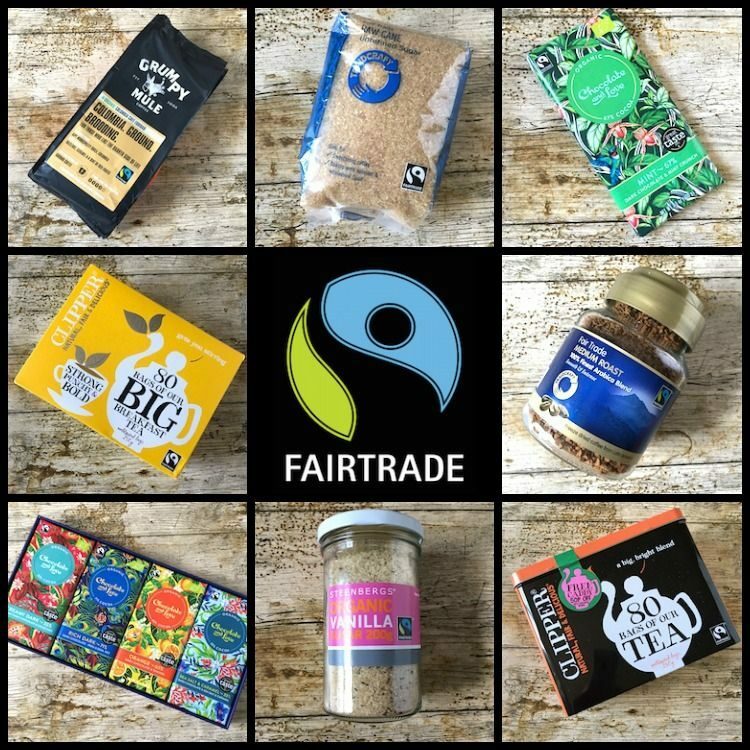 The choice of Fairtrade tea and coffee is huge now and many are easily found in supermarkets and other retail outlets. Likewise there’s a whole variety of fair trade chocolate to choose from. And if you have a sweet tooth, don’t forget the sugar. These are the products I was sent to try. Clipper only work with producers who are striving to improve the standards and welfare of farm workers and their families. In their biodegradable cartons, you’ll find primary grade tea leaves inside unbleached bags. This gets extra brownie points from me and means we can cheerfully put both teabags and cartons into our compost heap. It also means I can happily use them to make my kombucha. Their Everyday Tea is brisk and full flavoured with a coppery golden colour. For something a little stronger, try Clipper’s punchy and bold Breakfast Tea. The beans of this organic Colombia ready ground coffee are grown in the shadows of the Hulia mountain range. It’s a dark and brooding coffee with notes of hazelnut, caramel and just a hint of red fruit. If you need a kick from a mule to wake you up in the morning, this is the coffee for you. Grumpy Mule prides itself on having coffee with character. They are a small quirky, ethical company that only sells 100% Aribica organic fairly traded coffee. If instant coffee is more your thing, Traidcraft’s medium roast finest arabica coffee granules may be just what you need. Traidcraft have long supported farmers in developing countries and have been working to promote fairly traded products since 1979. They’re passionate about helping small producers to invest in their businesses and communities in order to create a sustainable future. Ideal as a sweetener for coffee, this unrefined demerara style sugar has a subtle honey flavour. It can also be used for baking – of course. Just open the jar of this vanilla sugar and be wafted off on a balmy breeze to sun drenched tropical climes. Steenbergs provide a range of excellent quality organic spices, many of which carry the Fairtrade symbol. Vanilla sugar makes for an interesting flavour in coffee or tea, but I like to use it in baking. I made some very special brownies with it the other day. Keep a look out for the recipe, it’ll be worth waiting for. I’ve reviewed Chocolate and Love bars on my blog many times. Their chocolate is organic, rich, smooth and not too sweet. The beans are high quality and sourced in Peru, Panama and the Domincan Republic. The chocolate is gluten free, soya free and five of the bars are suitable for vegans. Why not take a break with a few squares? I find just a couple gives me the chocolate fix I need. The chocolate comes in seven different flavours with CT preferring the coffee 55% and me the Sea Salt 55%. I’m just about to take a break now and I’m trying to decide whether it’s too naughty to have a hot chocolate like this one I made the other day. I used Fairtrade chocolate to make the drink and the coffee cardamom chocolate sauce was made with both Fairtrade coffee and chocolate. Thanks to the Fairtrade Foundation for sending me samples of the products mentioned. This is not a sponsored post. All opinions are, as always, my own. It’s great to know we can be a little indulgent and be sure that the people who produce these luxury items get a chance to better their lot as a result. Hopefully one day they’ll enjoy the same level of wealth and opportunity as we do in the developed world. Indeed, a more equitable distribution of wealth around the world is the best way forward. So many great fairtrade products, there no excuse for not treating everyone fairly. No indeed. I think much of the problem is that some people don’t realise what goes into growing and producing food and how poorly many workers are paid to do it. I love the idea of shopping Fair Trade all year around but Fair Trade Fortnight is a great reminder of the little changes we can make to help others. Exactly Jenny. I find getting reminders about things helps to keep me on track. Oh I didn’t know you’d grown up in South Africa. What a beautiful country it is – or so I’m told! Thanks Nadia. I think you’d like Chocolate and Love. The chocolate is very smooth, even the 80% bar. I tried their 100% at a chocolate tasting once and that was good too, but I haven’t seen it for sale. The Vego bars are completely new to me. I’ll look out for them. Yes, good point Elinor. I think you’re probably right. What a great range of products. We really should support businesses which are good for the environment and its people. Definitely eases the conscience. Thankfully there’s huge range of products available now and they’re not difficult to get hold of. Fairtrade Fortnight is a great marketing idea to remind us of what we should really be doing all year round. I have noticed that the ranges have really expanded in recent years, hopefully reflected in the wages and working conditions of those making these foods and clothing items. Your collage is lovely and that hot chocolate – mmm! Thanks Kellie. Indeed it would be good if the wages and working conditions of all farm workers were proper living wages. Thankfully those working within the fair trade movement are making a big difference to some communities.